Game of Thrones Season 7: the release schedule of the series, viewing online and a new storyline! 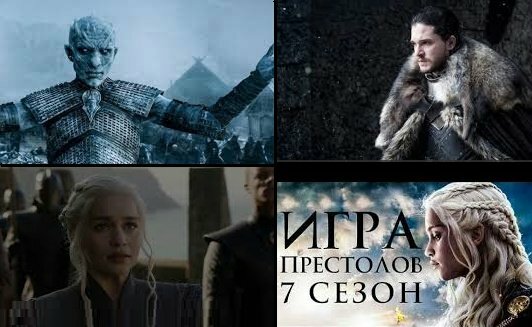 Already this Sunday, the new 7th season of the series "Game of Thrones" is released - one of the most famous television projects in the world. This fantasy series tells about the world of the Seven Kingdoms, in which there is magic, dragons and many more other equally mysterious things. The basis of the plot of this series is a series of books entitled "A Song of Ice and Flame" by American writer George Martin, which is now widely compared to John Tolkien. "Game of Thrones" - an epic saga, in which there are three main storylines and several minor ones. The main coincide with the events of the book, although not completely, and in the minor script writers have a little more freedom of action. The first and perhaps the most important story for the audience is the fate of Daenerys Targaryen, the hereditary princess of the Seven Kingdoms, who lost her right to the throne because of the rash actions of her father, who went down in history as the Mad King. As a result, the monarch was overthrown, he was killed by the closest of his comrades, the prince-heir died in battle, and Daenerys and his brother Viseris found themselves in exile far from their home. Now the whole sea shares her homeland, but having matured, she decided to regain the throne. Having received, according to a long-standing tradition, an invaluable gift - dragon eggs, she began her uneasy way to power. First, as the wife of the ruler of the savages, then - as their queen-Khaleesi, and then as the Destroyer of the Chains, that she wants to save the whole world from slavery and injustice. The third, and by the beginning of season 7, the storyline that comes to the forefront is the struggle of life and death, ice and fire. In the distant northern lands, where the sun never shone, an ancient evil awakened - white walkers. These revived dead, which the mysterious King of the Night on the dead horse leads forward, want only one thing - to destroy all life and turn the Seven Kingdoms into a lifeless icy desert, the sun over which will never rise. In season 7 there will be 7 episodes, their schedule is already known. Dates of release, by the way, may slightly change to the smaller side - from time to time new episodes “merge” into public access even before they are officially shown on TV.